Samsung released a funny commercial about the comparison of Samsung battery to that of Iphone. 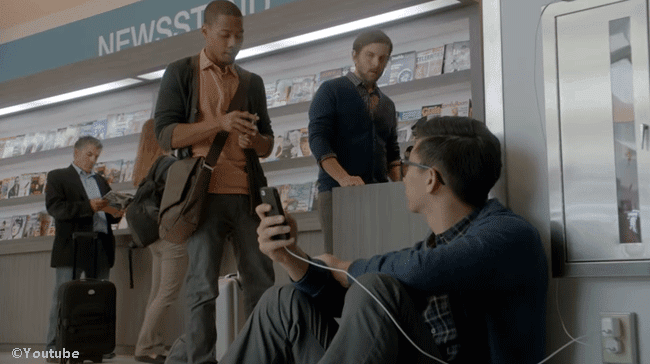 In the video that was done in a hilarious way, there are Samsung users who are passing by Iphone users. The Iphone users plugged their units with charger on different areas like the bathroom wall, airports and offices. If you are going to watch the video and you are either a Samsung of Iphone fanatic, you will surely be affected, maybe. Well, the video talks about comparison of batteries of the two products, Iphone and Samsung S5. The video depicts that Samsung has better battery since Iphone has to bring a charger to charge the unit so that it will have a power the whole day. Though the video was made humorous, there are comments on the video from Samsung and Iphone lovers. And they clash with each other. You will surely enjoy reading comments from two parties: Samsung and Apple fanatics. Well, there are people who are happy about the video and there are others who look at it as something that is not true and they keep on defending that Iphone has better battery than Samsung S5. The video has spread and we are still waiting for Apple’s official statement on the video ad created by Samsung. Well, whatever will be Apple’s statement and comment on it, we will surely inform you here. Which would you prefer? Samsung or Apple products? Please explain why.